Located 2 km from Puerto Banús, Aloha Gardens is close to several golf courses, bars, restaurants and supermarkets. It features 3 outdoor pools, one of which is covered and heated in winter. Its attractive apartments and villas feature private terraces. The large, air-conditioned apartments and villas at Aloha Gardens are set in gardens and most have views of the golf course and mountains. All accommodation comes with satellite TV and a fully equipped kitchen. On arrival, guests receive a welcome food pack with tea, coffee and bread. WiFi in the apartments is available for an extra cost. The Aloha’s pretty grounds feature waterfalls and pools. Guests can enjoy sea views from the resort’s terrace. Aloha Gardens also has a small fitness room, a hot tub and sauna. The sports centre has 2 tennis courts and a court for football and basketball. The Hotel Puerto Azul is a modern property situated opposite Fontanilla beach on Marbella's sea-front boulevard, just 500 metres from the old town. The hotel has its own Restaurante Puerto Azul, a colourful, contemporary eatery serving Spanish and international cuisine. There is an outdoor swimming pool and a large terrace where guests can catch the sun. The 40 studios and one-bedroom apartments are decorated in cool neutral shades with tiled floors and modern furniture. All offer furnished terraces with sea views, as well as air conditioning, kitchens, coffee and tea-making facility, safes, hair dryers, direct-dial telephones and satellite television. This property is 3 minutes walk from the beach. Set in a residential apartment complex, in Marbella’s stylish Puerto Banús area, Club Jardines del Puerto has a large garden with non-heated outdoor pools. The air-conditioned apartments feature a private balcony. The apartments at Club Jardines del Puerto have marble floors and modern décor. Each one has a kitchen with a hob, washing machine and coffee-maker. The Jardines del Puerto has tennis and paddle tennis courts. Staff at reception can help booking rounds of golf and other activities. The beach is just 250 m from the complex. You can walk to Puerto Banús’ main nightlife and restaurant area in 3 minutes. Málaga Airport is a 40-minute drive away. Situated in Marbella, this air-conditioned holiday home features a balcony with sea views. Providing private parking, the villa is 11 km from Paseo Maritimo. Free WiFi is provided. A dishwasher, an oven and a microwave can be found in the kitchen. A TV is available. There is a private bathroom with a bath. 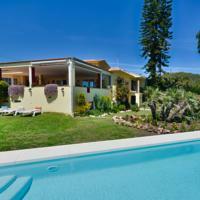 Funny Beach is 15 km from Casa Sofia 2, while Marbella Bus Station is 8 km from the property. The nearest airport is Malaga Airport, 47 km from the property. Offering accommodation with air conditioning, Livescape Villa Coto Real is set in Marbella, 8 km from Paseo Maritimo. Funny Beach is 12 km from the property. Free WiFi is provided throughout the property. The accommodation is fitted with a flat-screen TV. There is a seating and/or dining area in some units. Some units also have a kitchen, equipped with a dishwasher, an oven, and a microwave. Free private parking is also available at this villa. Towels are available. Livescape Villa Coto Real also includes an outdoor pool. Marbella Bus Station is 4.1 km from Livescape Villa Coto Real, while Plaza de los Naranjos is 5 km away. The nearest airport is Malaga Airport, 44 km from the property. Offering an outdoor pool and views of the sea, Villas Altos De Marbella is located in Marbella in the Andalucía Region, 5 km from Paseo Maritimo. Funny Beach is 9 km from the property. Free WiFi is featured in the open air areas. The accommodation is air conditioned and is equipped with a seating and dining area. Some units feature a terrace and/or balcony with mountain views. There is also a kitchen, equipped with a dishwasher and oven. A microwave and coffee machine are also provided. There is a private bathroom with a bath and a hair dryer in every unit. Towels are available. 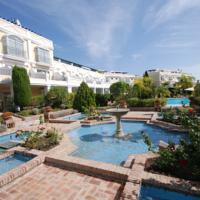 Villas Altos De Marbella also includes a year-round outdoor pool. Estacion de autobus is 700 m from Villas Altos De Marbella. Malaga Airport is 40 km away. Each of the elegant villas at Villas Marina has a private garden with an outdoor pool, barbecue and furnished terrace. 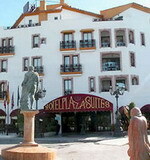 They are located in Puerto Banus, 10 minutes’ walk from the beach. Spacious, bright and air-conditioned, they feature a modern white décor with colourful finishes. Each one includes a lounge with a fireplace, flat-screen TV and DVD player. Free Wi-Fi is available, and their kitchens are equipped with an oven, microwave, dishwasher and washing machine. A wide range of dining options can be found in Puerto Banus, many within 15 minutes’ walk of the villas. It also offers a selection of boutique shops, night clubs and bars. Marbella can be reached in 10 minutes’ drive, while Malaga Airport is 35 minutes away via the AP-7 Motorway. Free private parking is offered at Villas Marina.